Recent studies have revealed that treatment with N-acetyl-l-cysteine (NAC) improved airway function in Chronic Obstructive Pulmonary Disease (COPD) patients and lowered the frequency of acute exacerbations. In this study, we investigated the biochemical mechanisms through which NAC exerts its protective effects against bronchial epithelium cells exposed to cigarette smoke. To evaluate the efficacy of NAC to counteract the deleterious effects induced by cigarette smoke, we treated human bronchial epithelial cells (16 HBE) with NAC alone and in combination with cigarette smoke extract (CSE). After treatment, we measured reactive oxygen species (ROS) formation, effect on cell viabilty, glutathione resources (contents and genes), inflammatory cytokines expression (IL-1 β, IL-6 and TNF-α) and antioxidant genes expression SOD1, SOD2, iNOS, HO-1, NRF2, IRE-1α and PGC-1α. NAC treatment was able to counteract free radicals (ROS) formed and reduce viability after CSE induced oxidative damage. 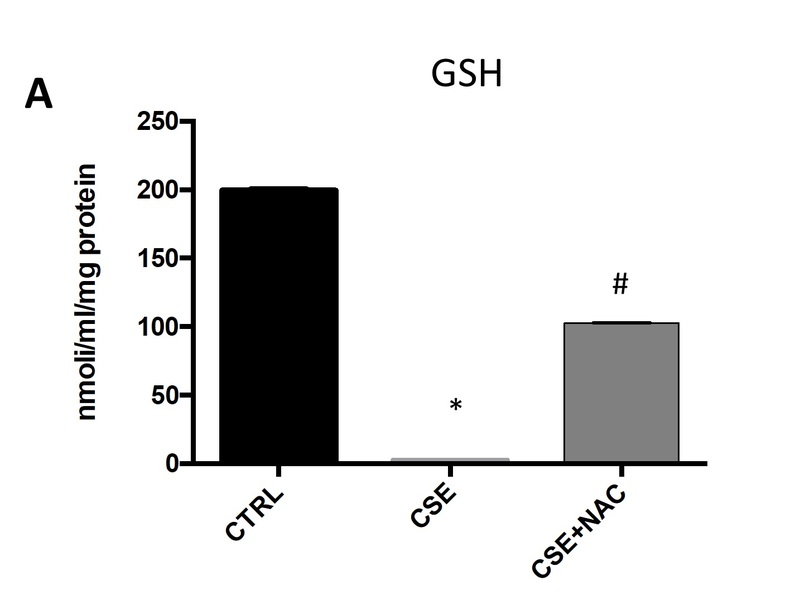 Moreover, NAC increased the GSH’s resources and gluathione metabolism gene such as GPX, GCLC and GT, restored the gene expression of SOD1, SOD2, reduced expression of pro-inflammatory cytokines, and was able to positively regulate expression of iNOS HO-1, NRF2, IRE-1α and PGC-1α. Our results demonstrated that NAC treatment restores endogenous antioxidant defenses in human bronchial epithelial cells exposed to cigarette smoke extract suggesting its use in the therapeutic strategy of patients with COPD.